On our recent 3 days trip to Philadelphia Washington DC and Niagara Falls, we visited many beautiful places, few natural, few man-made. Niagara fall has its own awe-inspiring charm and larger than life beauty. 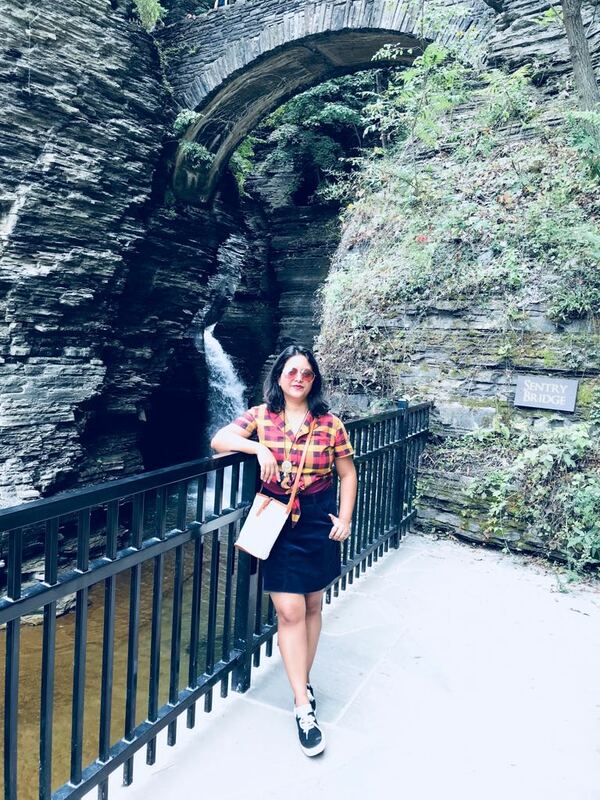 But on our journey, one more place which fascinated us most is the Watkins Glen State Park and I would not be able to do justice to this place if I don’t write a whole blog post about it.So let’s start with where is watkins glen? 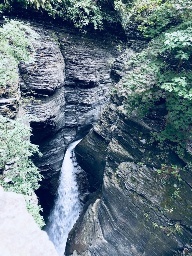 Watkins Glen State Park is situated outside the village of Watkins Glen, in New York’s Finger Lakes region,245 miles away from New York City. The best part about this place is it’s tucked in just next to the main road of a small town, where you will never expect a place like this. You just enter the park, walk for half a mile and voila! You are transported to the magic land, to some ancient Era. 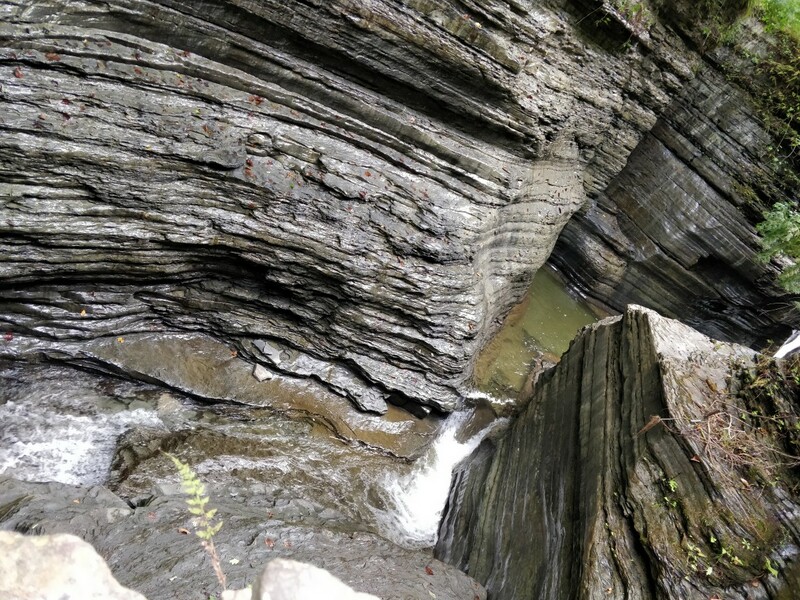 This is the most famous one among the Finger Lakes state park, not without a reason. From its Rocky cliffs to spiral caves to cascading waterfalls, it has a dramatic landscape which never disappoints the nature lovers. The park has three trails, Indian trail, south rim trail and Gorge trail. 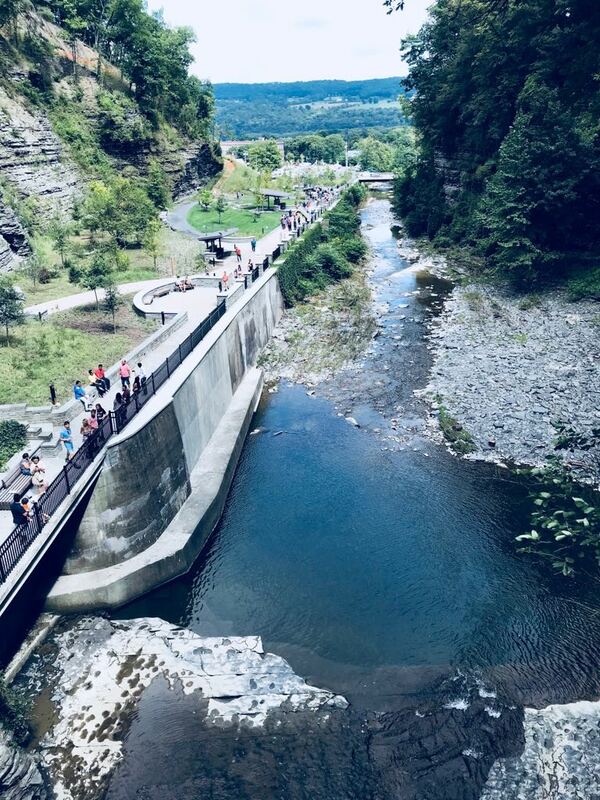 Gorge trail is the most popular among all because of its easy accessibility and you get the best scenic view. Rest of the two trails comes under woodland. 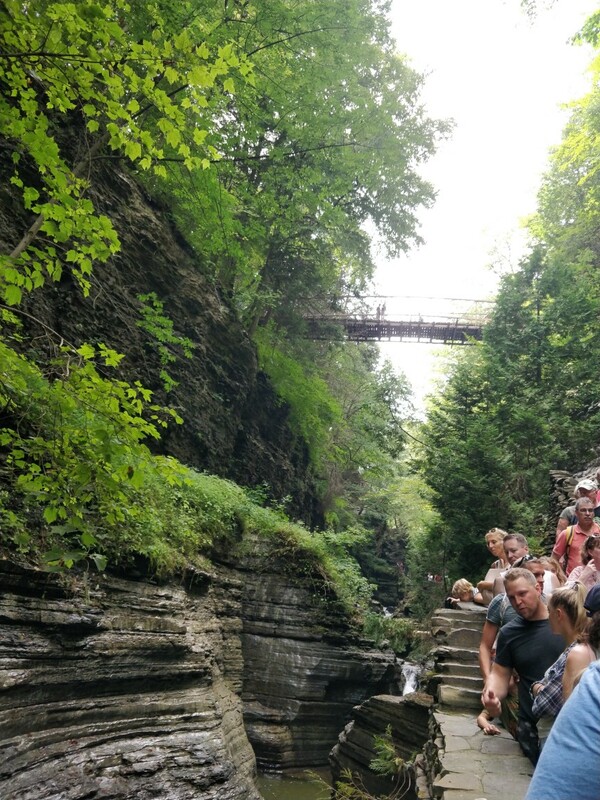 Gorge trail is a combination of stone bridges and more than 800 stone steps altogether as it runs over, under and along the park’s 19 waterfalls. The park has three entrances, Main, upper and the south entrance. As suggested by our guide we chose the upper entrance as you can cover the trail by descending down instead of climbing up these many steps. It was a lot more easier, as we had many small kids and elderly people in our travel group. After entering the park we crossed a hanging bridge, called a suspension bridge which is 85 feet above the creek. From the bridge, you will be able to get the first glimpse of the picturesque view. 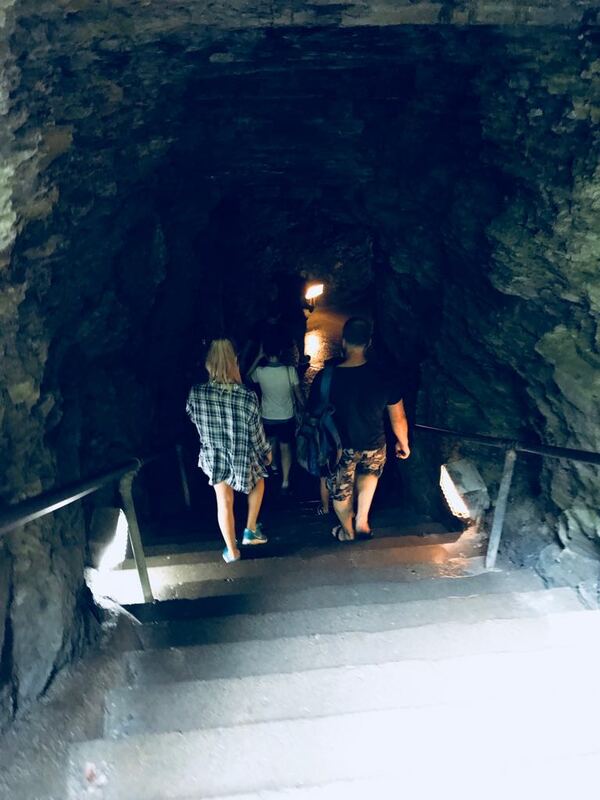 Once we crossed the suspension bridge, after climbing down around 200 steps we reached a carved tunnel named appropriately as “spiral tunnel”. The beauty of this tunnel just blew away our mind. Surrounded by dim light the cave almost felt like otherworldly. Once we came out of the tunnel we encountered the waterfall named “cavern cascade”. 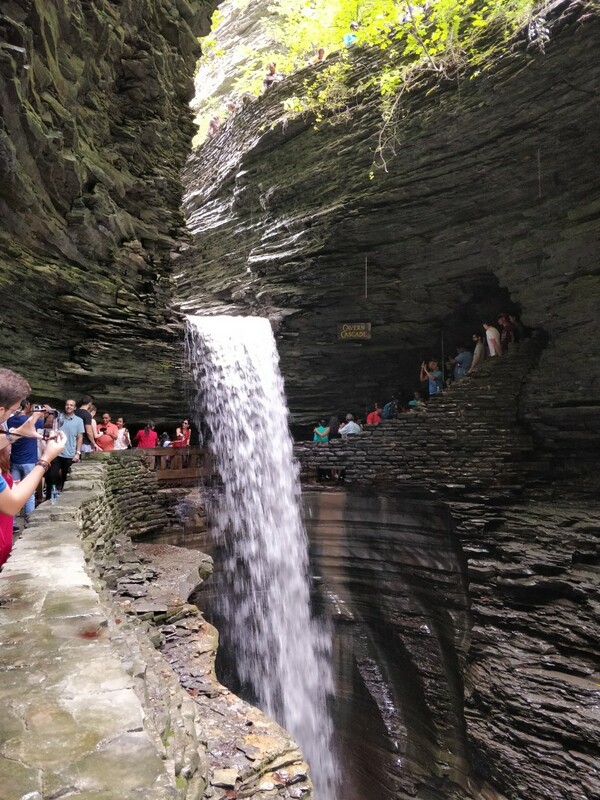 The steps through which you walk down is just behind the waterfall, so you get sprays of mist all over you. The place is cool even on a summer day because of its woodland and misty fall water. We enjoyed the beauty of the surroundings and tried to capture as much of it as we can in our frame. But I know my pics are not doing justice to the surreal beauty of this place. Being a long weekend, it was difficult to take a single photo without getting photobombed by the crazy crowd present in the premises. We had to cover the whole trail in a slow-moving queue. 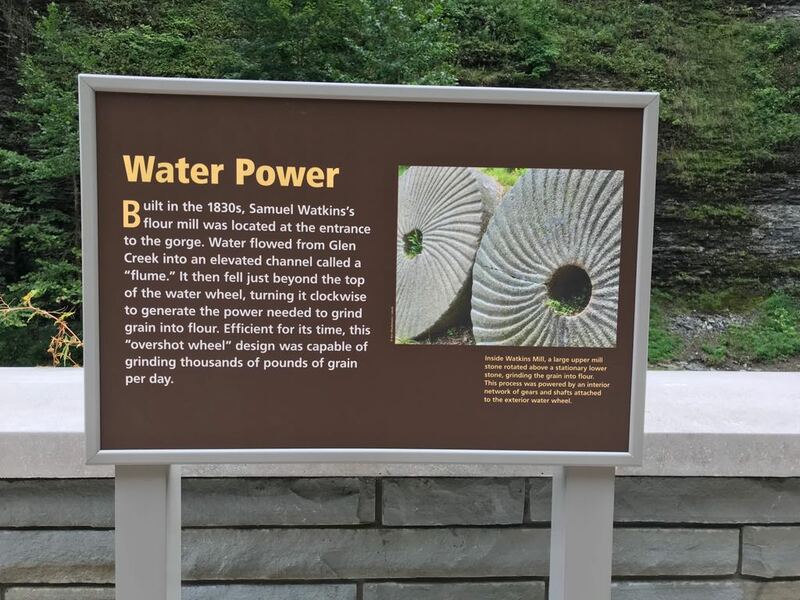 Throughout the park, we noticed interpretation of Watkin Glen’s unique natural and cultural history so nicely written on boards. Finally, we reached the sentry bridge before exiting from the main entrance of the park. The park can be visited from mid-May till early October. During winter, it’s mostly closed. Summer months are the busiest months and the place gets overcrowded. Spring and fall are the best seasons to visit this place. During the fall you get to view spectacular fall foliage. 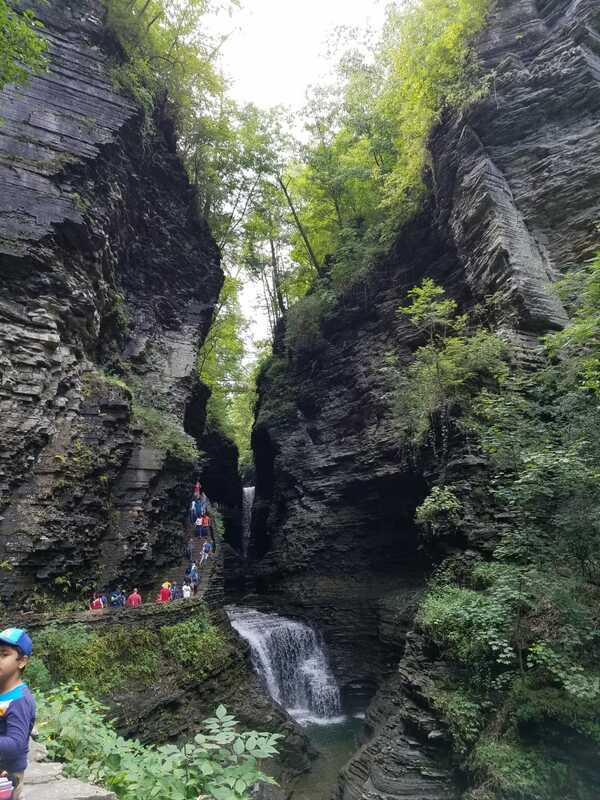 It’s better to wear your best walking shoes or sneakers as you have to climb too many steps.Also because of the spray from the falling water the steps get wet and slippery. So flip-flops or sandal should be avoided. If you want to enjoy the serenity of this beautiful place and want to take some great photographs then long weekends and public holidays should be avoided. 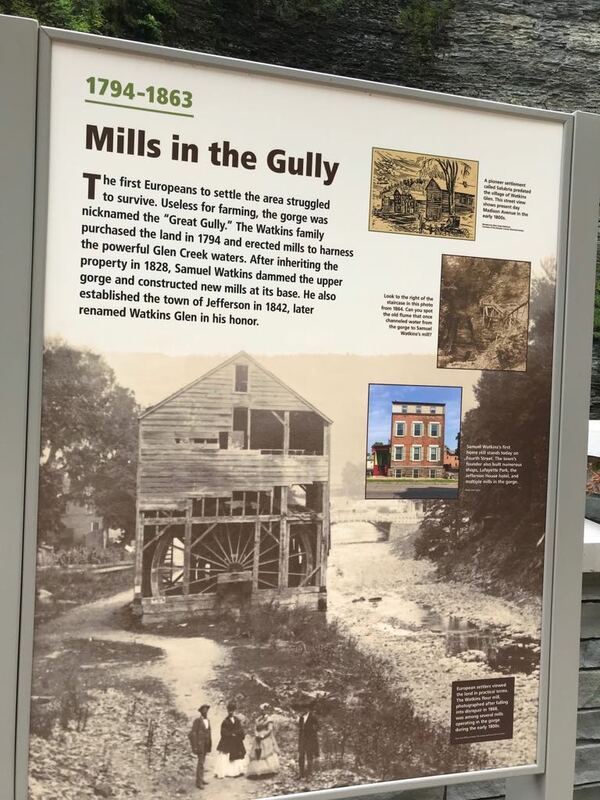 I’m definitely going to visit this. Thanks to you. I have never heard that spot before and it is so interesting to know. I like the waterfall and this kind of cave. And thanks for tips about things to know and best time to visit.